There is no need to suffer through summer heat when inexpensive, energy-efficient air conditioners are widely available. Since October 26, 2015, all ENERGY STAR rated room air conditioners have been required to meet a new standard, ENERGY STAR 4.0, that sets maximum power use at 10% less than older models following the 2014 guidelines. And, when used to provide cooling only where they're needed, room air conditioners are less expensive to operate than central units. This guide will help you find the model that is right for you. A room air conditioner's efficiency is measured by the energy efficiency ratio (EER). The EER is the ratio of the cooling capacity (in British thermal units [Btu] per hour) to the power input (in watts). The higher the EER rating, the more efficient the air conditioner. Each increase of 1.0 on the EER scale represents a 10% increase in energy efficiency. When buying a new room air conditioner, information about the EER can be found on the EnergyGuide label for the unit. Look for an EER of at least 12 and the ENERGY STAR label. Earning the ENERGY STAR means a product meets strict energy efficiency guidelines set by the U.S. Environmental Protection Agency and the U.S. Department of Energy. 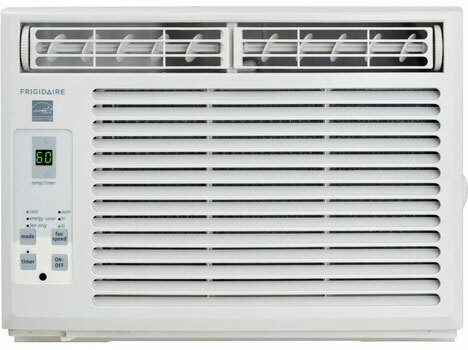 ENERGY STAR 4.0 qualified room air conditioners often include timers for better temperature control, allowing you to use the minimum amount of energy you need to cool your room. The required cooling capacity for a room air conditioner depends on the size of the room being cooled. Room air conditioners generally have cooling capacities that range from 5,500 Btu per hour to 14,000 Btu per hour. Many people buy an air conditioner that is too large, thinking it will provide better cooling. However, an oversized air conditioner is actually less effective — and wastes energy at the same time. Air conditioners remove both heat and humidity from the air. If the unit is too large, it will cool the room quickly, but only remove some of the humidity. This leaves the room with a damp, clammy feeling. A properly sized unit will remove humidity effectively as it cools.To figure out which size unit is best for your cooling needs, see the Air Conditioner Cooling Needs Calculator below. Do you need a smart air conditioner? For those that keep to a regular schedule and don't have smart home devices installed in their home, a timer will help save money (about $100 on the air conditioner itself and your energy bill) and save you from coming home to a hot, stuffy home. For many, though, the ability to control a room air conditioner from anywhere can be a huge help and cost savings, especially if you don't stick to a schedule. And, you can connect them to other smart home devices so they fit seamlessly into your daily routine. The Frigidaire FFRE0533S1 ($167.99 on Amazon), rated at 5,000BTU, gets high marks for its cooling and dehumidification capabilities of up to 1.1 pints per hour. The unit, which has an EER of 12.2, two cooling and two fan speeds, a 24-hour programmable timer, built-in thermostat with digital temperature readout, remote control and a four-way adjustable vent to direct air flow. 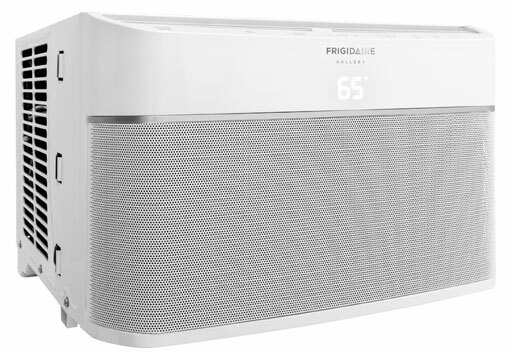 The Wi-Fi connected Frigidaire Cool Connect ($297 on Amazon) delivers 8,000 BTUs, enough to cool a room up to 350 square feet, with an EER of 12.0. The unit has 3 fan speeds and 2-way slanted louvers that direct airflow in an upward, circular motion for even cooling. You can create a custom 24-hour schedule or control the unit remotely with the Frigidaire app for iOS and Android or dedicated remote control. And, it works Google Assistant and Amazon Alexa enabled products. If the power goes out, the unit will automatically restart when power is restored. It has an air ionizer to help remove allergens, like pollen, and other impurities from the air and the magnetic front grill, which has an antibacterial filter, easily detaches for cleaning. 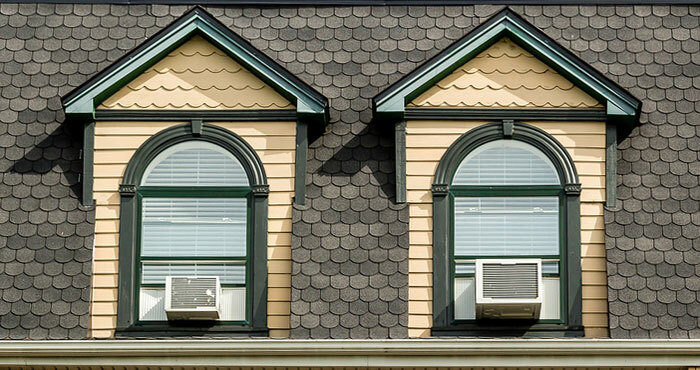 A little planning before installing your air conditioner will save you money and energy. The unit should be level when installed so that the inside drainage system and other mechanisms operate efficiently. If possible, install the unit in a shaded spot on your home's north or east side. Direct sunshine on the unit's outdoor heat exchanger decreases efficiency by as much as 10%. You can plant trees and shrubs to shade the air conditioner, but do not block the airflow. Set the fan speed on high, except on very humid days. When humidity is high, set the fan speed on low for more comfort. The low speed on humid days will cool your home better and will remove more moisture from the air because of slower air movement through the cooling equipment. Also, consider using an interior fan in conjunction with your window air conditioner to spread the cooled air more effectively through your home without greatly increasing electricity use. We like the Haiku Home L Series 52-inch Indoor/Outdoor Wi-Fi Enabled fan ($475 on Amazon), which provides coverage for indoor or outdoor space of up to 15 by 15 feet. It has a built-in LED light (40-watt equivalent) with 16 brightness settings. And, because it's WiFi enabled, you can use your smartphone or Amazon's Alexa for control. And, if you can't install a room air conditioner in your window, consider a portable unit. You can check our picks for portable air conditioners. Determine the square footage of the area to be cooled. For the purpose of this chart, rooms that are connected by permanently open entryways wider than five feet ought to be considered as one room and their square footage should be combined. We have a 6’d x 8’w x 7’h (interior dimensions) dog house for our great dane and other large dog. The dogs are kept outside during the day and we allow them in our house when we are home from work. We insulated the dog house for the winter and added a space heater. This works well as they are both short haired dogs. Our question is what is recommended to keep them cool in the summer. It’s already in the nineties here. We were considering an A/C unit but that may be overkill given the size of the room. I can’t agree more with your opinions and reviews. All these are definitely remarkable and needs to be noted. This can surely help those who’re having problems with choosing the right air conditioner for their home. This is a must share. AC That "Samples" The Air? The trouble with all room air conditioners that I have owned is that when you run them in the Energy Saver mode they never seem to turn back on until the room becomes over heated. I have a room heater that once it warms the room and shuts off it “samples” the room air temperature every 15 minutes by running it’s fan for a few seconds. That feature works great. Is there a room air conditioner that has this air temperature sampling feature? If there isn’t there should be. Get an LG room air conditioner. There energy saver setting works!! I like the easy way to calculate AC size with just a few modifiers, but it seems like there is one missing. How would you modify the calculation in the case that you only plan to us the AC at night in a bedroom. Thanks for the reviews! Great tips for those looking to get a window air conditioner for their home as well. I wanted to thank you for your information on choosing an air conditioner. I agree that the size of the room determines the size of the machine. You make a really great point on looking at the controls arrangement and checking for built in timers.Since the summer is finally hear and my apartment has zero air conditioning this is my first time buying an air conditioner. I wasn’t sure what to look for but this really helped. Thanks for the great advice. Hey Suzanne Kantra, Great post. I read your article and the tips which you mentioned here…I shared the same tips with my friend, who was looking for Air conditioner 1 week ago. He is impressed and found the right air conditioner for his home. Thanks for sharing information.! Would you be interested in acquiring list of top IT Decision Makers? We are offering you over one million IT Decision Makers lists with complete business contact information including business email addresses. This list consists of top IT Decision Makers across all industries. Every contact has been verified to make sure you get live and accurate records from us. If you are interested please respond to this email to know more. I have a 500 square-foot bachelor apartment attached to a large three car garage that I converted into a one bedroom apartment. It’s now 650 sq ft. with a kitchen, a living room and a bedroom. I think it’s too small to install central air. Is there a window unit large enough to cool off three rooms? There are air conditioners that can cool off spaces that large (look for a 1400 BTU model), but the issue will be getting the air circulate through the 3 rooms. You might be able to do it with fans, but you’re probably better off purchasing units for each room. HELP! 5500 BTU Window Unit on 100W Solar Panel? I’m not worried about how many hours a day it will run it, I’m just curious if it will at all. (I think we are going to go ahead and use this part time and if extra is needed just plug it in and use the electricity (since we pay for it!!) but it needs to be “functional” for him… I know, deceitful, but I can’t afford to set his house up with solar power and I’m desperate to be able to work in cooler conditions. That’s pretty crappy of your landlord, and it may even be illegal, depending on where you live. You may want to check into that angle. In any regard, if his objections are one of safety from window units falling out or damaging the window, perhaps you should consider a portable unit. They’re around the same price of a window unit and you can move them from room to room, so you need fewer of them. Plus, your landlord may not even notice you have it, since it just requires a small venting space in the window when operating. If your landlord is concerned about the house’s circuitry being able to deliver the necessary current for your AC and other items, then the solar option may work. Though it will be far more expensive than a portable unit, require installation on the roof (which your landlord would also likely object to) and not give you the portability. Thanks for sharing an informative article. If you really want to make your life more comfortable then get Cielo Breez and use with your window AC. Thank you for sharing this wonderful article. I have one window AC in my bedroom which have 3 years old. Now, its cooling is less. So, I should refresh it? I wish I had a better AC unit! Nice Post.I have one window air conditioning in my room. Presently, its cooling is less. Things being what they are, I ought to revive it Thanks for sharing this information.